Ride. Break. Fix. Repeat. Most avid cyclists are familiar with this cycle. If you ride enough, your bike will experience routine wear and tear as well as occasional mechanicals and will sometimes require maintenance. You can do plenty of bike maintenance yourself with minimal tools: lubing your chain, keeping your tires properly inflated, repairing flats, replacing worn tires and cleaning your bike are just some examples. However, some jobs are best left to professional mechanics because they require special tools and/or skills. 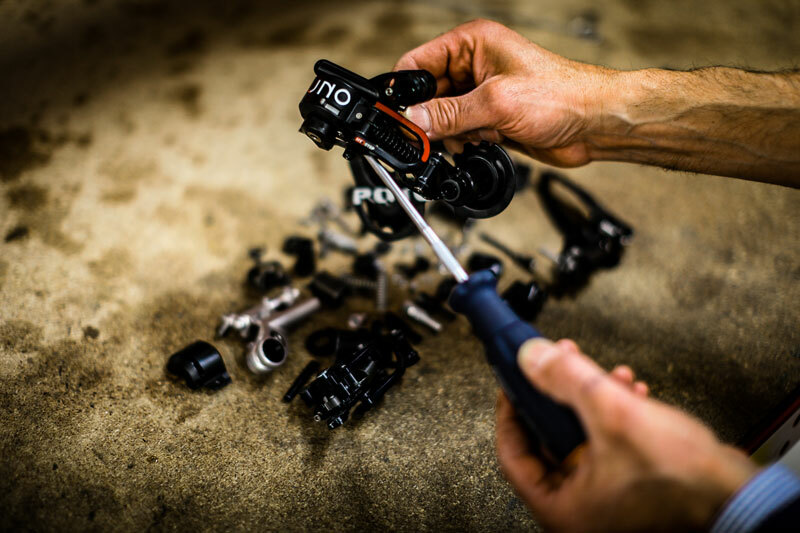 Unless you already have the right tools and are mechanically inclined, you may want to reach out to the pros for help maintaining the following parts of your bike. Brake pads wear out with use and must be changed for all kinds of brakes. For mechanically actuated brake pads, cables and housing will have to be maintained, and for hydraulic brake, their hydraulic lines will require occasional bleeding and even replacement. Thanks to constantly changing standards, there are more types of bottom brackets than we can possibly list in this article. Add to that all the different types of cranks, and you’d need an entire toolbox full of special tools to pull all the types of cranks and install and remove all the types of bottom brackets. Fortunately, most modern bottom brackets are fairly robust and don’t require frequent maintenance, so you can save the investment in special tools and get your local shop to repair your bottom bracket whenever you notice issues. Keep an ear out for clicking and popping and notice any roughness as the pedals turn – all signs that indicate some maintenance is due. Building and truing wheels is as much of an art as it is a science. You’ll need the appropriate spoke wrench for your spokes, a truing stand and plenty of patience. A spoke tensioner is also a good idea for ensuring correct and even spoke tension across the drive and non-drive sides of your wheels. Furthermore, depending on your wheel type, replacing a spoke may require you to remove a tire and rim strip tape, which can be an especially messy job if you run tubeless tires. Routinely inspect your wheels to see if they need maintenance. Spin them and look for wobbles to see if they need truing. Visually inspect spokes and rims for damage and pluck each spoke with your hands to roughly evaluate whether spokes are consistently tensioned. An conspicuously loosely or tightly tensioned spoke may be a sign that you will soon experience more issues with your wheels. Bottom brackets and hubs are like cousins. Hubs also come in many different designs. Some have replaceable bearings; others have cartridge bearings. Some come completely apart and some don’t. In general, different hubs require a variety of tools to remove the cassette and get into them. With many different pieces, taking them apart to service and clean and re-assembling them correctly is no elementary task. We suggest riding ROTOR’s new, low maintenance RVOLVER Hubs, and then if and when you do need service, hire a pro with all the right tools and expertise to quickly and effectively take care of your hub maintenance. Service most hubs at least once a season – or more often if you frequently ride in wet or muddy conditions. Some signs your hub need attention are 1) a roughness in the bearings when you spin your wheel; and 2) side-to-side play in the hub bearings when the wheels are mounted in the frame/fork and a lateral force is applied at the rim. Suspension designs vary widely by manufacturer and model, and each fork or shock will come with different service recommendations and require different parts for routine maintenance and repair. Some forks and shocks are more serviceable than others; some may even require getting sent back to the manufacturer or specialized shock repair shop. Thus, we suggest getting a pro to perform the required routine maintenance as well as help you troubleshoot any specific performance issues or failures. Check manufacturer guidelines for your specific fork and/or shock for recommendations about service intervals; they will usually specify what kind of service to perform after a certain number of hours of being ridden.